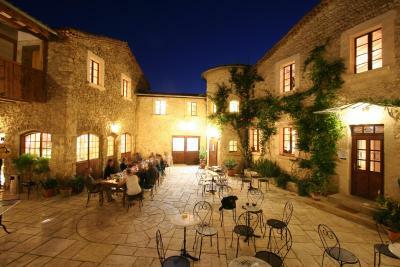 Lock in a great price for Relais du Silence Auberge La Plaine – rated 8.8 by recent guests! The rooms are very comfortable and the breakfast is excellent. The Auberge is perfect point to discover the 'Drôme Provencal' which is a beautiful region and which is just a few kilometers away. Gorgeous buildings. Immaculately restored. Good parking. Linen gorgeous. Lovely place in the country, with beautiful gardens and nice rooms. Beautiful place and wonderfully reconstructed from an old farmhouse with a lovely courtyard restaurant/bar. Definitely worth finding. Food was excellent and service wonderful. Peaceful small hotel in the country. Lovely part of France to explore & ideal as a stop over travelling down through France with dogs. The river nearby the hotel (100m) and the views. The building itself and courtyard are very beautiful. Belle propriété de charme restaurée avec goût; associé à un restaurant semi-gastronomique. Accueil très chaleureux dans les deux cas. Un petit coin de Suisse au cœur de la Drôme. Belle chambre confortable, bien que l'insonorisation soit insuffisante par rapport aux autres chambres (si voisin bruyant); par contre environnement très silencieux..
Relais du Silence Auberge La Plaine is a 7-minute drive from the center of Chabrillan and 4.3 mi from Crest. It offers an outdoor swimming pool, a garden and a terrace with outdoor furniture. Free Wi-Fi is available. All rooms feature a desk, a wardrobe and a private bathroom with free toiletries, a shower and a hairdryer. A continental or buffet breakfast can be enjoyed every morning at Relais du Silence Auberge La Plaine. The hotel’s restaurant serves regional dishes. This hotel is 350 feet from the Drôme River and 12 mi from the Easy Golf, which is 1.9 mi from Montmeyran. Free private parking is available on site. 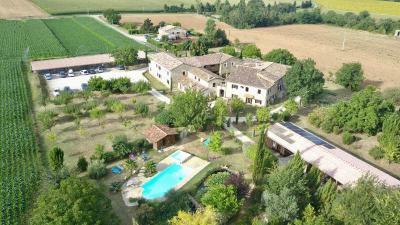 This property also has one of the top-rated locations in Chabrillan! Guests are happier about it compared to other properties in the area. This property is also rated for the best value in Chabrillan! Guests are getting more for their money when compared to other properties in this city. When would you like to stay at Relais du Silence Auberge La Plaine? This room is more spacious and offers a desk, a wardrobe and a private bathroom with free toiletries, a hairdryer and a shower. House Rules Relais du Silence Auberge La Plaine takes special requests – add in the next step! One additional child under 2 years is charged EUR 10 per person per night in a crib. Relais du Silence Auberge La Plaine accepts these cards and reserves the right to temporarily hold an amount prior to arrival. Please note that the restaurant is open during the weekends in winter. It is open every day for lunch and dinner during the summer. Please note that the swimming pool is available from April to September. Quite expensive for what it is. Actually the place was not really quite or silent. There is a train line nearby and at night the trains are audible. The food in the restaurant was mediocre. Breakfast is very limited, when in france you eat crispy croisssants, pain au chocolat and baguette but these were nowhere to be found. On the other hand there were a variety of cheese available. The room itself was very basic and very hot with leftover mosqitos on the ceiling. This property has so much potential, step up!